Offering uncompromising travel to passengers, the all new Gulfstream G600 will succeed the G550 when it begins making deliveries to customers in 2018. With a spacious cabin and long range capability, the G600 is one of the newest and finest aircrafts to join the Gulfstream family fleet. With the ability to fly at 6,200nm, the G600 is one of the fastest business jets on the market with tremendous efficiency and cabin comfort. It has a long-range cruise speed of Mach 0.85 and the ability to fly 4,800nm at a high speed cruise of Mach 0.90. 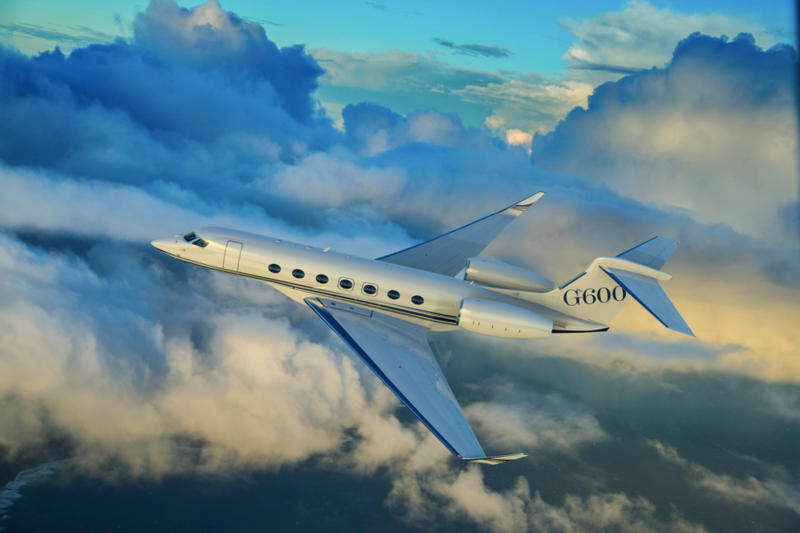 In comparison to the G500, the G600 can fly 1,200nm farther with a maximum cruising altitude of 51,000ft. The twin P&W engines are engineered to have low noise levels and emissions, making the cabin exceptionally quiet. The G600 offers a 45-foot cabin with 10 individual living space options for customers. Up to 4 living spaces and a forward or aft galley are available. The interior of the cabin is designed to provide a relaxing atmosphere and journey. Owners can use Gulfstream’s design flexibility to display their own style in the G600 by selecting from some of the finest materials. The aircraft’s 14 large panoramic windows provide ample light and an increased sense of spaciousness to the cabin that seats up to 19 people. The ultra-long range aircraft offers 27-inch-wide seats, a shower, and height adjustable conference tables that are easily maneuverable and perfect for working or dining. HD monitors are present onboard as well as a printer and scanner that make communicating with colleagues easy. 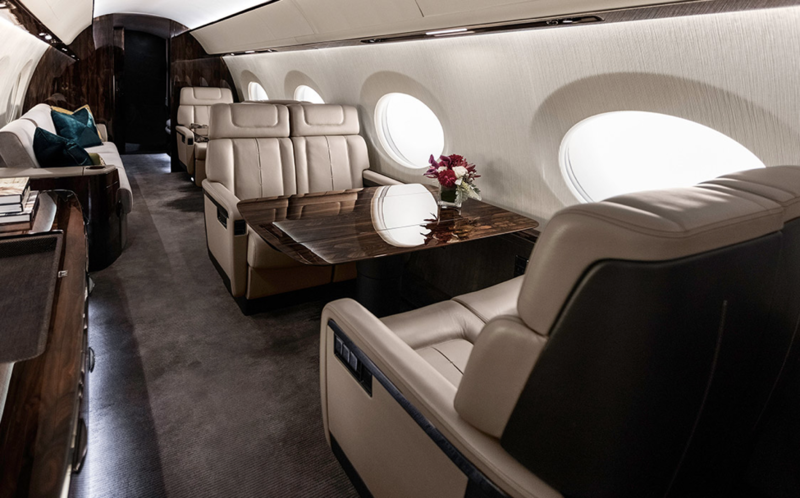 The Gulfstream Cabin Management System gives passengers access to control lighting, shades, temperature, and entertainment systems through touch screen devices. Additionally, 100% fresh air is replenished every two minutes throughout the cabin, making travelers both comfortable in-flight and upon arrival. Developed by Gulfstream, the Symmetry Flight Deck comes standard in the G600 and features active control sidesticks that will replace yokes, allowing for more room and comfort for pilots. 10 touch screen interfaces replace numerous switches on the flight deck, improving efficiency, safety, and overall layout of the cockpit. The G600 will also incorporate the latest generation of Gulfstream’s Enhanced Vision System by bettering the resolution of the infrared sensor and expanding the camera’s field of view for better visibility in bad conditions. 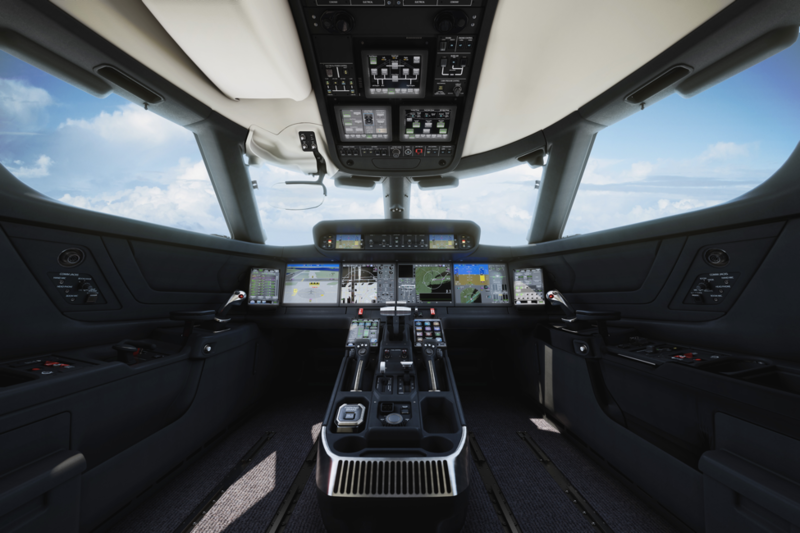 The computer-controlled systems within the G600 also received an upgrade, now acclimated to detect flight controls, auto throttles, and autobrakes. The Gulfstream G600 completed its first flight on December 17th, 2016, spending almost 3 hours in the air and kicking off the flight-test program for the new aircraft. The company says it’s looking forward to journeying toward certification and delivery for the G600 in the coming months.